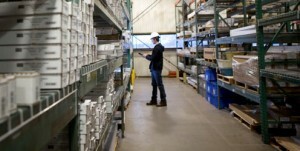 Keeping track of stock as it arrives and works its way through a retail organisation is vital. Wireless enabled scanners use the wireless network to update management systems in real-time. There is also a range of RF tags and readers to quickly and accurately record the movement of stock automatically. This speeds up the process of finding specific articles which offers operational improvements for retailers and improved service for customers.